Some kapton with vacuum-deposited aluminum (VDA) coating used in thermal blankets that protect many of our spacecraft from the rigors of space flight and direct exposure to the sun. A satellite dish of significant girth to act as a massive parabolic collector and focuser of solar energy. A R-2000 Rotopod, and a thermal data acquisition system like those used in our thermal vacuum chamber. 1. Line one of the dish antennas with the VDA kapton, shiny side out, turning it into a solar reflector. 2. Insert thermal data acquisition system deep into the turkey toward the center of the stuffing. Connect thermocouple to data acquisition system and set limit to 75 degrees C.
3. Stick the bird on a rotopod platform. Mount the rotopod offset to the dish antenna feedhorn, making sure to position the mount so that the rotopod is not between the bird and the dish, and so that the rotational axis is perpendicular to the feedhorn. Program the rotopod to make a 180 degree rotation every 30 minutes. Initiate rotation. 4. Program dish to track the sun and initiate tracking. 5. Prepare mashed potatoes, cranberry sauce and everything else as usual while turkey cooks (best to do this mid-day for maximum solar irradiance). 6. Exact cooking time may vary depending on the time of day, air temperature and wind speed. Turkey may be dry on the outside, but towards the center there ought to be some decent meat and stuffing. 7. When the thermocouple reaches the limit, remove and carve the bird. 8. Eat, watch football, fall asleep. One Thermal Vac Chamber like the one at NASA's Goddard, which is 40 feet tall and 27 feet. Assuming a stuffed turkey takes up a cubic foot or so of space, the thermal vac could hold ten or twelve thousand at one time with room to spare for candied yams and drip pans. 1. Get the turkeys in individual seal packing to ensure a juicy finished product. Otherwise, as the vacuum pumps go, the chamber would double as a dehydrator and leave you with 12,000 birds' worth of turkey jerky. 2. The chamber is normally used to simulate outer-space temperatures and can heat to about 300 F*. While its maximum temperature is less than a conventional oven, sticking a 25-pound turkey in for a slow-cook at 300 F for five-and-a-half hours should do the trick. 3. One of the greatest time-savers of the thermal vac test kitchen is that you can cook and freeze all in the same chamber. 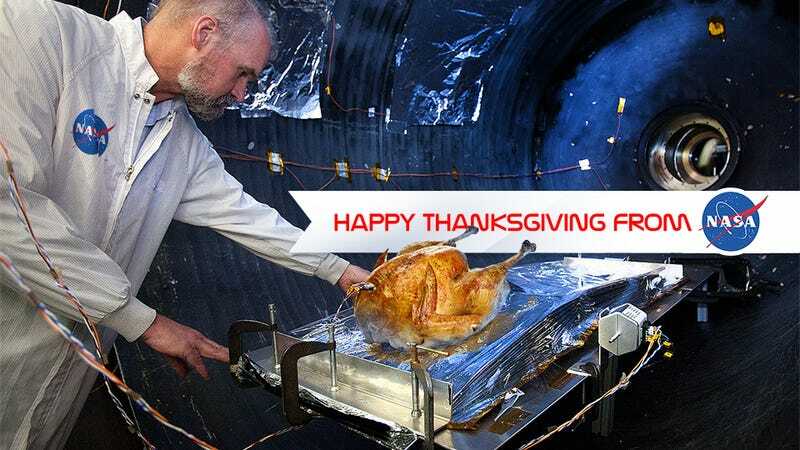 If you won't be ready to eat all 12,000 turkeys right away, you can plunge the chamber down and preserve your leftovers at a brisk -310 F.
* In the near future, the thermal vacuum chamber will be used to freeze and bake the Global Precipitation Measurement (GPM) spacecraft, to prepare it for the temperature swings it will experience as it moves in and out of Earth's shadow. GPM's testing will cycle several times from about 7 F to 104 F in vacuum - not hot enough to cook a turkey safely, but good enough for most raw food stuffing recipes. One Solar Dynamics Observatory spacecraft (for extra-crispy turkey, you need one Solar Probe Plus*). 1. Strap it to the front of the Solar Dynamics Observatory—on the sun-facing side it would be exposed to temperatures of around 400 degrees F (200 C). Leave it there for 1 hour and 45 minutes for it to cook completely. 2. If you're doing one of those recipes with an initial high temperature blast, which then requires that you lower the temps for a long final roast, you could move the turkey over to the side of the spacecraft for awhile, where temperatures get lower. 3. To make sure it survives until humans are able to eat it, move it the deep freeze in the back of the spacecraft where temperatures get as low as –300 F (-200 C). All spacecraft must deal with this thermal problem in which parts of the spacecraft are much much hotter than others - cooling and heating systems are employed within to try to keep instruments at consistent temperatures. * You have to wait a few years for this alternative. The Solar Probe Plus will launch no earlier than 2018 and it will come closer to the sun than Mercury, flying as close as 3.7 million miles away from the sun as opposed to SDO, which is almost 93 million miles away from our home star. 1. Get the turkey in the protective box. 2. Fire the rocket engine for 1:45 hours. That's it. Here's a crew escape system rocket test. These are significantly more powerful than most sounding rockets, but you get the idea of how this will work.